Yamaha FS800 Guitar Review 2019 – is the Yamaha FS800 acoustic guitar worth the money? Review of features, pricing, design, sound and more. Yamaha is known for their quality, solid instruments that have been able to cater to novice players, as well as professionals. It’s typical to go to any guitar store and bump into their electric or acoustic guitars, backdropped by their pianos, woodwinds, and drums. When the Yamaha FS series of guitars was debuted more than 50 years ago, the company set out to prove that quality, acoustic guitars do not need to be expensive. The FS series focuses on playability and durability in a small and compact design. Every aspect of the FS line is crafted to design a better guitar. From dried woods to technologies that help create full sounds, the FS series is made to be a lifelong partner for the dedicated instrumentalist. The Yamaha FS800 guitar is the company’s standard guitar, and a crowd favorite. It’s designed to look, sound, and operate as a traditional guitar – without breaking the bank. It’s composed with new scalloped bracings. The bracing design on the Yamaha FS800 is intended to create a more round sound in the lower and mid-range. It’s one of the more affordable acoustic guitars offered by Yamaha, with a form factor that is compact and accessible to younger instrumentalists and adults as well. However, it is arranged with unique features – regardless of its miniature size – to make it a true Yamaha guitar. One of the main differences between Yamaha’s FG and FS series is that the FS series comes in a more smaller form factor. The Yamaha FS800 is a concert-sized acoustic guitar, allowing it to be very lightweight and portable. The Yamaha FS800 also comes with a hard case for storage as well as transportation. This is the guitar that comes with portability in mind. Because of its small form factor, the Yamaha FS800 guitar is ideal for women as well as children. Individuals with shorter hands or arms will appreciate the size. It’s aesthetic is also very familiar, even to those who have never picked up a guitar. The Yamaha FS800 is a dreadnought guitar, and it has become the most common design for acoustic guitars. Colloquially called “dreads” by musicians, these type of guitars are robust, designed to create a bolder and richer tone. It’s also at home in the skilled hands of an experienced guitarist, with Yamaha incorporating the latest technologies into the Yamaha FS800. It’s a solid guitar made from spruce, with the neck made from nato wood. Dedication to lasting products makes it very typical for Yamaha guitars to last for a lifetime, and that same sort of endurance is also showcased in the Yamaha FS800. That durability comes down to the type of woods used in the body of the acoustic guitar. Spruce is particularly beneficial for a guitar, due to its high stiffness-to-weight ratio. This is why the Yamaha FS800 is known to be lightweight, but still be so durable that it’ll last for decades with proper care and maintenance. The Yamaha FS800 is celebrated for its small size, but big sound. It’s made with premium materials that help improve its playability, as well as its sturdiness. The acoustic guitar is feature-packed for its price point, and it’s a perfect instrument for those who are starting with their first guitar. It’s also an acoustic guitar that can be used in almost any genre and scenario that calls for a guitar. Simply put, the Yamaha FS800 is lightweight, produces rich sounds, and is accessible to most people, regardless of experience level. However, there are a few cons that you should be aware of, especially with a guitar of this size. For larger individuals, the concert guitar may be too small, with a jumbo or grand jumbo being more suitable for their size. The Yamaha FS800 guitar also does not have a strap button on the body’s neck side. There is no inlay on the neck side of the third fret. Yamaha FS800 vs. FS830, Should You Upgrade? The FS830 has a better aesthetic, but that is largely subjective. It’s a 12 string and is mostly made with mahogany woods. The Yamaha FS800 also has a black neck binding. 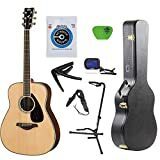 The unique aesthetic of the FS830 may have a better feel when strumming, but you are also paying a premium, with the FS830 being more costly. The expense may not be worth it, especially if you are not all that interested in the slight aesthetic difference between the two models. Both of these acoustic guitars by Yamaha tend to be confused with each other. Even though they share a similar name, there are some distinct differences between the two. The FG800 is a full-sized guitar. Yamaha did not want to alienate anyone, so the FS800 took cues from the FG800, with it being much more compact. Typically speaking, Yamaha’s FS line is a much smaller versions of the FG series. Other than the size difference, you’re getting guitars that perform almost identically. The FS800 series is even smaller than the FS700 series, genuinely making it compact and convenient to younger instrumentalists and those with smaller frames. Should You Buy The Yamaha FS800 Guitar? The Yamaha FS series has been the standard for quite some time, especially for those who are interested in a shorter acoustic guitar. It combines traditional looks and aesthetics of a guitar, at an affordable price point. Regardless of its size, it’s a solid top guitar with an authentic sound and robust strength, thanks to its scalloped bracing. The only thing you should be cognizant of is the size of the guitar. It’s perfect for beginner guitarists and professional players who want something that is very manageable. Although a potentially limiting factor, the small size of the Yamaha FS800 is the perfect size for upper-level fingerpicking type of players. The Yamaha FS800 guitar is available via online stores or Yamaha’s dedicated website. Based upon feedback submitted by over 110 customers the Yamaha FS800 Guitar has received an average 4.6 out of 5 star rating. We discuss why in this review article.